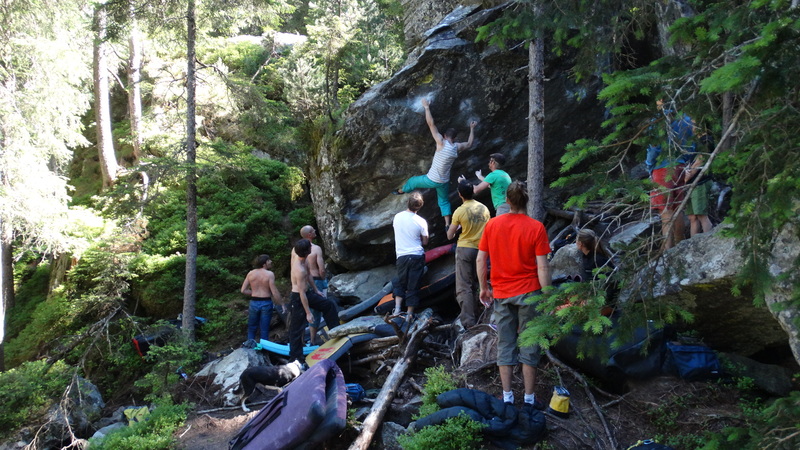 This is (at time of writing at least) one of the most famous bouldering venues in Europe, and with good reason. I finally visited in November 2012 and it was cold. Bloody cold. That said, after a couple of days, we found a couple of places that eased the pain caused by the sub-zero temperatures, which i’ll elaborate in a second. I then returned for a birthday trip in 2015 and the conditions were perfect. First time round and while i could see the potential brilliance of the place, it was tough to develop the psyche to actually make any headway. Second time and there were no excuses and, save for the occasional bit of rain, nothing to stop us from hitting the high sevens with a good amount of success. It may have been me but i found most of the climbs a touch soft for the grade – not the worst thing in the world considering they are consistent; something that, for me, is far more important. One thing i did notice on that first trip was the grade spread: my companion Jim, at the time of that first trip, was climbing around 6a at the max and we hadn’t noticed that the climbing tends to start around there. For those climbing in the 7s, it is thoroughly recommended but for those below that, an alternative destination may be a more productive option. There are excellent nearby options, such as Val Calanca a touch further south, for those who want a bit of both. Situated in a steep river-side forest, the landings are often not for the feint hearted – again, this place leads itself to those with a little more experience and a bit more grit. The problems can also often be quite high, so take that extra pad if you’re wondering whether to squeeze one more in the car. Magic Wood is a serious venue in all respects really but if you’re pysched for it, and good enough to have plenty to go at, it is an essential destination. Huge respect should go to Bernd Zangerl and Thomas Steinbrugger, among others: they were the ones who found the place and negotiated access after some quarrels with local hunters. You could think of them as the fathers of Magic Wood, with it’s current “President” undoubtedly being Tomasz Saluz – a man you will doubtless meet and one you really should, he’s awesome. It is now very tidy with no litter problems, a great camping spot and is generally an awesome place to go. 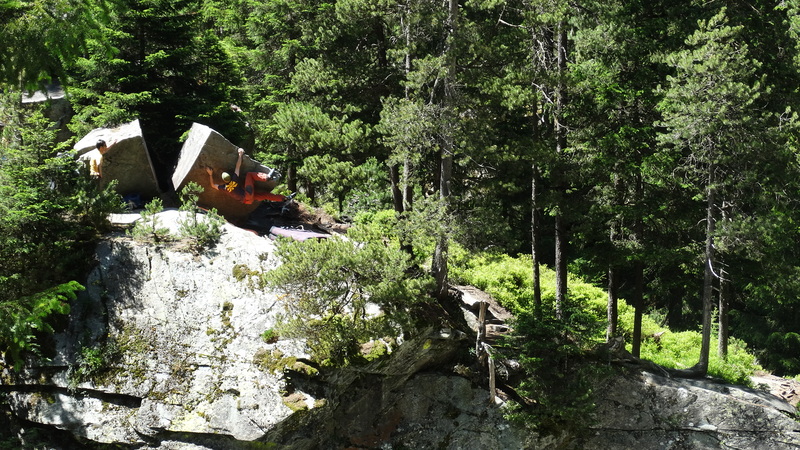 Do please respect the access though – there are some fantastic looking boulders just above the North bridge but they are not in the agreed sectors so again, please leave them alone. If you don’t, you’ll jeopardise access for the whole area for everyone and again, from what i know, it is still a little tentative. More information on access is available on the 27crags.com website so please read and more info on the development of the area can be seen on the film, Better Than Chocolate. The climbing is situated between two bridges and is right next to the campsite so no need to drive. There are two guides who break it down into different sectors but it is so concentrated that there is no break between them like other venues. There isn’t really anything to distinguish them and none in particular that stand out – just get into the forest and see what grabs your fancy! As said above, the first port of call should definitely be Tomasz in Ausserferrera. If you’re after somewhere, he’ll be able to point you in the right direction. My second trip (as usual) allowed me to find a multitude of other amenities too that were missed the first time around. Guidebooks. There are two options at time of writing: Swiss Bloc and Alpen En Bloc Vol. 1. Both are sufficient, i prefer the latter. It has had a second print and i will stress if you own the first edition, buy the second. The first one was poor at best, adding to the misery of our first trip and the second is far superior. Food. There are plenty, if you have a car and a rest day to kill. Andeer is your nearest town and has a reasonable supermarket, and nearby Splugen has likewise. A bit further is Thussis, with a larger selection of larger shops and further still is the city of Chur with more than enough to keep anyone going for a lifetime. 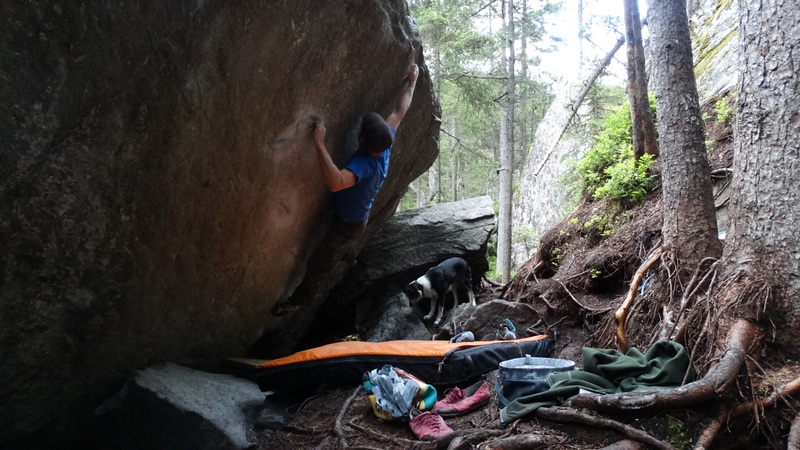 Climbing Shops. 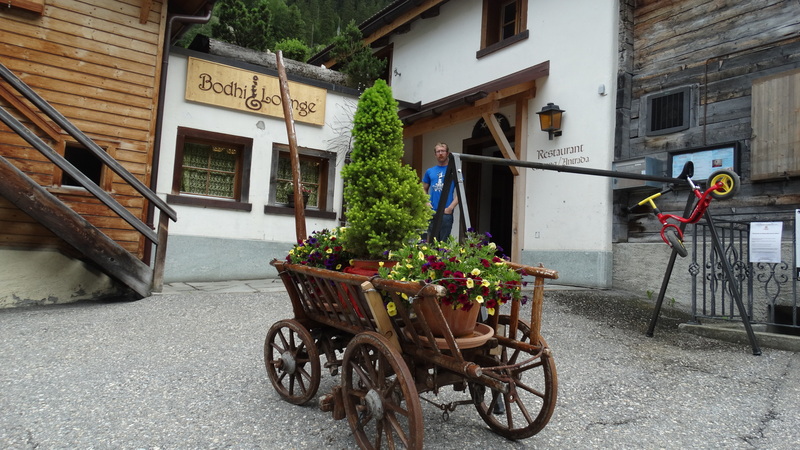 Tomasz runs a pretty basic shop, ideal for chalk, brushes, some basic camping equipment and some clothing. It is a little limited but has the essentials if you don’t need anything big. If you do, there are quite a few outdoor shops nearby, in Thussis and Chur, and one large shop in Chur. As an outdoor shop officianado, i wasn’t very impressed and i’m not sure why, but they do have a range of climbing and approach shoes, and any tent or stove needs would easily be met here. A quick online search for “outdoor shop Chur” shows there are many more i’ve missed. Accomodation – Campsites. There is only one, but there need only be one, and it is roadside on your right as you head up the valley. It is a great site: there is a covered area for cooking and chilling, a large flat area for tents, and even a slackline down the hill slightly. A small and incredibly limited shop is open briefly during high season and serves for absolute essentials: pasta, beer, tobacco, etc. Payment is all done by an honesty box, with small envelopes and your details written on the front. They do check and you can go to the Gasthaus if needs be but PLEASE be honest with it, as it adds to the charm of the site that they are happy to operate like this and without that site, there would probably be no Magic Wood. Also, PLEASE no wild camping – the site really doesn’t cost much and not using it could cost everyone an awful lot more. Nearest WiFi: Yup, that edelweiss again. Showers. An unusual one to put in here but worth mentioning as the campsite has no toilet block, leaving you with two options: wash in the river for free or pay 4CHF at the Gasthaus for a brilliant hot shower. Other handy places. Much more than first appears, such as the vet in Thussis for Brits with pets. There are sadly few shops selling cheaper souvenirs that i came across in any of the towns but with a little searching, you’ll almost certainly find whatever you need. Thank you for the excellent article on Magic Wood. We are traveling to Chur in July 2018 and would like to climb in Magic Wood for a day. Do you know of a guide who could transport us to the area and guide us for the day?